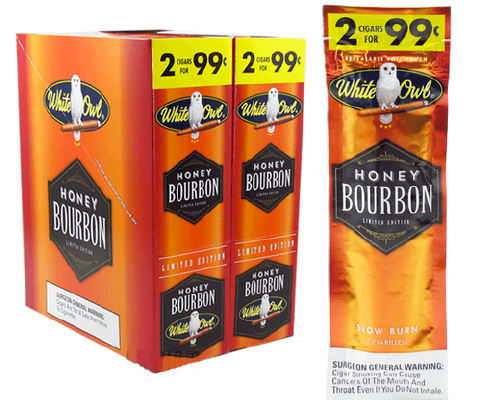 White Owl Honey Bourbon 2 for 99¢ Cigarillos cigars are an exciting new flavor from the famed American brand. These cigars feature premium tobaccos infused with the tasty essence of your favorite libation, honey bourbon, for a superb mild bodied flavor and appealing aroma. Conveniently packaged in foil pouches for ultimate freshness, they are perfect for taking anywhere you go to enjoy when you have a short break. White Owl Honey Bourbon 2 for 99¢ Cigarillos are a limited edition flavor so get them while you can! Available in 30 packs of 2 each.